In our continuing efforts to offer the highest quality veterinary medicine, we are pleased to provide a wide range of surgical services for our patients. From routine surgical procedures, such as spaying and neutering, to more complex surgeries, such as orthopedic, lumpectomies, hernias or foreign body removal, we look forward to the opportunity to care for your pet's surgical needs. 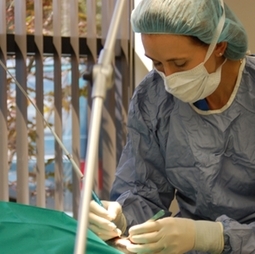 We perform our surgeries with a surgical laser. This allows for faster healing, less blood loss and less pain. We also use gas anesthesia, which is easier on the pet because it is metabolized quickly and they are able to wake up quicker. Being able to easily bring them out of anesthesia also allows us to react quickly if their blood pressure or heart rate spikes or drops dramatically during the surgery. The safety and health of your pet is our priority, that is why we include pre-surgical bloodwook with our surgeries. Bloodwork is an internal exam that speaks volumes about your pet that could not be seen or felt in a physical exam. It tells us how their internal organs are functioning quickly and easily, and if there are any internal infections or anemia that may cause issues during surgery. Your pet is an important part of your family, and when he or she needs surgery, you want the best medical care available. The Veterinarians and Staff at our clinic are ready to provide your pet with cutting edge veterinary medical care.